As you build a healthy landscape with native plants and create and foster wildlife habitat, you are building a food web which will ultimately attract top tier predators. Top tier predators such as hawks need good nesting habitat as well as an ample food source to feed their young. The same is true for insects. Many insects predate on other insects, so they need their prey to be present as a food source and sometimes for rearing young. 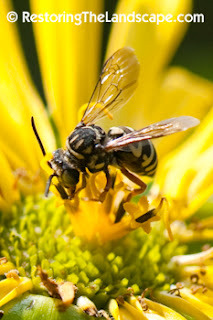 There are many types of cleptoparasitic (Cuckoo) native bees - bees that don't collect pollen and build nests, but instead lay their eggs in the nests of other bee species. The host species' larvae is usually killed leaving the bee bread (pollen and nectar ball) for the Cuckoo Bee to eat as it develops. The Cuckoo Bee, Triepeolus spp. is a bee that lays eggs in the nests of Long Horned Bees, Melissodes spp. This was the first year that I observed this type of Cuckoo Bee in our landscape. 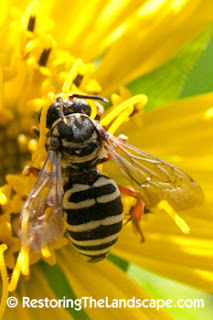 A distinctly colored bee with a black body and white stripes. This particular species has brightly colored orange legs. 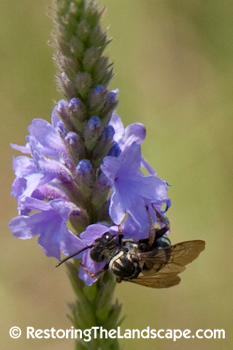 Cuckoo Bees will visit flowers for nectar only (no pollen collecting structures). I observed this Triepeolus sp. nectaring on Cup Plant and Hoary Vervain in mid-July. The Long-Horned bees (host) are ground nesting bees. The female digs a multi-branched tunnel into exposed, sandy soils. The Cuckoo Bee slips into the ground nest and lays its eggs when the female host bee is out foraging for pollen and nectar. Cuckoo Leafcutter Bee, Coelioxys sp.